This is a Westerner’s overview of Indian music. If you are motivated to pursue more depth and poetry on the subject, I recommend you visit www.ravishankar.org and then click on Indian Music. Four of the swaras are mutable in a flatted version. For example, you can see by the diagram that the space between Sa and the second note, Re, has three possible steps, or three microtones. Any sound played in these three microtones will be named komal Re (Re flat). The choice of how much to flatten the Re is up to interpretation by the musician in accordance with the raga he is playing or singing. For example, as described and sung by Sayeeduddin Dagar in a vocal class I attended, if it is an early morning raga which always features a komal Re, and the sun has not quite risen, the komal Re will be struck or sung closer to the Sa, say at microtone #2. As the sun rises, the artist will actually adjust this komal Re accordingly to the #3 or #4 tone. We are talking very subtle here, but once you tune into it and hear a master doing it, you will begin to deeply appreciate this ancient musical culture. It may move you to tears of rapture. The other notes that can be komal are Ga, Dha and Ni. The thing about Sa is that it does not represent a specific universal pitch. Sa is the first note of your scale, the home pitch of the raga, but it is not necessarily, for example, the note “middle C” on the piano. I have to bring this up because it seems to confuse and alarm non-musicians when I tell them Sa can be any note. I think it is generally regarded that “Do” represents middle C on the piano, thus the diagram for the Western chromatic scale gave you the letters associated with that system. The reality is that the sitar and the sarod sound best in the pitch of C#, so Sa becomes C#. 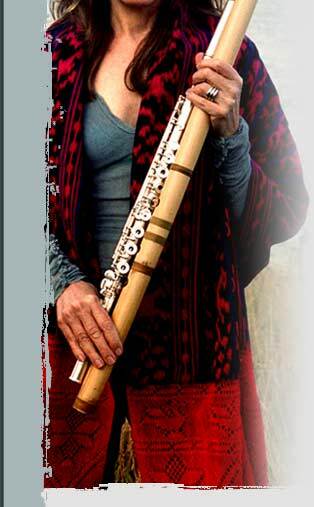 With bamboo flutes, the longer the bamboo, the lower the pitch, but as far as the human body can stretch, there is no way you could play a bamboo flute in middle C. The bamboo flute Hariprasad Chaurasia plays is in E, so for him Sa is E. Sachdev’s flute is in F, so his Sa is F. Female vocalists generally sing in a range which puts their Sa in A, male singers anywhere from C to F. The rest of the scale is built from Sa. Just sing a comfortable note right now with your full voice and hold it for a few seconds ... that is probably your personal Sa. Out of these seven basic elements of Indian music, including the komal (flat) and tivra (sharp) variations, ten parent scales called taats (also spelled thats) have been born. Some of the taats are exactly the same as some of the Western scales, particularly the jazz scales, but some you may never have conceived of. From these ten taats literally thousands of ragas are created. A raga is the form of Indian music, the blueprint, sort of like the form of a sonata in Western music. It is built up in stages, like movements, from slow to fast, andante to allegro to presto. However one should be careful not to draw too deeply a comparison with the Western form. The raga is truly sophisticated in its originality and basically is incomparable. The form of raga begins with the alap, a note by note revelation of the raga without rhythmic accompaniment which is an introduction not only to the raga but to the musician’s inner feel of it, and moves on to the gat, the composition of the melody, and then on to increasingly faster tempos including rapid melodic riffs known as taans, and usually ending with a thrilling rhythmic section called jhala. From these ten scales, which are the notes of the ten basic ragas, many variations are made, each variation becoming a specific raga. Each raga invokes a certain mood, a time of day, a feeling. Some of the variations are made by deleting notes from the scale. There are 5, 6, and 7 note scales and sometimes that applies only to the ascending or descending half (the Sa is only counted once, the octave of Sa is included here to complete the sound of the scale). Each raga lays emphasis on one main note, called vadi, has a second most important note, samvadi, and may have an excluded note, a note that is never played, vivadi. An example of a variation on the Kalyan taat is Raga Hindole. While the basic Raga Kalyan is a peaceful raga played after teatime near sunset, Hindole is a springtime raga with a bright and lively, upward lifting energy. The scale is: S G M’ D N S .
Another variation on Raga Kalyan uses both the tivra Ma and the natural or shudh Ma. Two other favorite variations on Kalyan, both 5 note or pentatonic scales, are Raga Hans Dwani (the sound of the swan): S R G P N S and Raga Bhupali: S R G P D S. If you can sound out these scales, you can see how changing just one note changes the whole feeling of the scale. This would give you a glimpse of the diversity and complexity of ragas. I said earlier that Indian music does not use harmonies like chord structures. It does make use of a resonating drone sound, however, which gives immense body to the melody line. The instrument used for this drone sound is the tamboura, sometimes spelled tanpura. It is made of a 30" to 42” wooden stem fitted into a big, round-shaped dried gourd. It has 4 strings, which are most often tuned to the notes: Pa (5th) Sa (octave) Sa (octave) Sa (tonic). The strings rest on the curved surface of the bridge where pieces of thread are inserted to create the buzz of the rich overtones. The inner surface of the tamboura is intricately carved to enhance the resonance within the gourd. To play the tamboura hold it upright and place one hand parallel to the strings. Using the middle finger for the first string and the index finger for the rest of the strings, slightly depress the strings while sliding the finger sideways across the strings in a continuous cycle. The constant drone of the tamboura helps the musician find the precise intonation and strangely enough it also helps to find the mood, inspiration and emotion of the piece. It is the ultimate trance instrument. There are variations in the size of tambouras, which allow for the different pitch for Sa, and some tambouras have 5 strings. The rhythms in India are another story entirely. I can only offer here a brief glimpse. My experience, as with any beginning classical Indian music student, was to have lessons not only in my chosen instrument, but also in vocal, in precision tuning and playing of the tamboura, and in the basics of tabla playing. The tabla is a set of two quite sophisticated hand drums used exclusively in the classical music of northern India. The first tal or beat pattern that is taught is a 16 beat rhythm called teen tal. You have to play it and repeat it until it gets in your bones. Over and over, the 16 beats with their natural break points, pulses into your body until you no longer think about it, the rhythm takes you over. One of my favorites is a seven beat tal called rupak, divided into one pattern of 3 beats and two patterns of 2 beats. The melody, or gat, of a raga I know in rupak tal begins on the 4th beat, so even the tals can have variations. Rupak tal kind of swings. Can you feel it? Listening to Indian music is healthy and relaxing. I hope you enjoy your exploration.